At Just Knead It our goal is to make you feel exceptional. For those of you who would like better understand what will happen in your first remedial massage we have provided information below. If you have any queries or concerns please feel free to call or send us an email. We have also attached out Client Health History Form. Feel free to print it out at home and bring it with you to save you time. Your Remedial Massage Therapist will take a moment to read through your client history form and enquiring about information you have written down. Based on what you way they will put together a set of differential diagnosis which they will rule in or rule as based on a physical assessment. 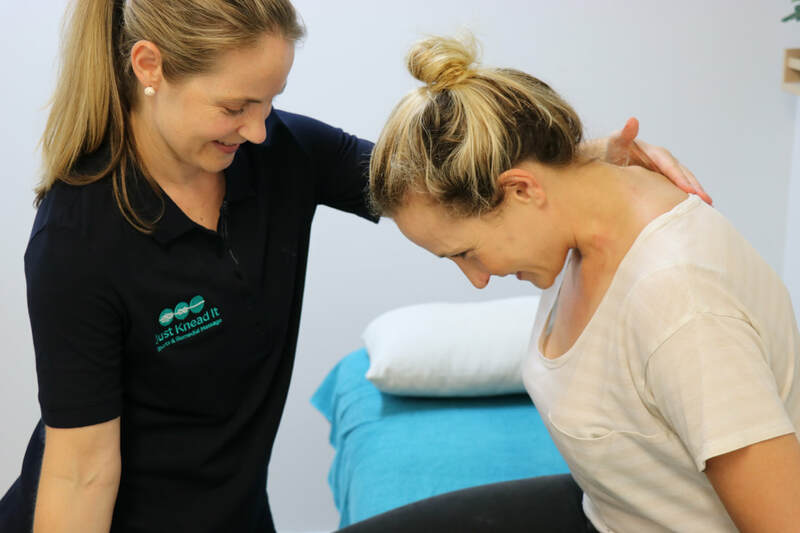 You massage therapist will ask you to do a standard set of tests which we require every client to do as well as test specific to what you have come in for on that day. These will including working out which muscles are tight and/ or weak, testing joint ranges of motion as well as specific tests to rule in and our different conditions and injuries. Once your massage therapist has established what is going on they will talk you through their findings, establish priorities for todays massage and give you advice on what they think is the best plan of action for today's session. Your massage therapist will then instruct you to change out of your main clothing and down to your underwear if you are conformable to do so. They will provide you with a towel to cover yourself and instructions regarding which way to lie on the massage bed. They will then leave the room so you can get changed. Your remedial massage therapist will use a variety of treatment techniques including trigger points, stretching, hot and cold therapy, cupping, effleurage, joint mobilisations, ART and additional neuromuscular techniques. They will continuously ask you about pressure and get feed back from you regarding pain levels, how an area is feeling and your general well being. As the massage processes they will talk to you about their findings and what improvements and being made. They may do additional testing and retesting whilst you are on the table to save time and ensure their massage treatment is getting you results. Towards the end of the massage your therapist will summaries the progress that they have made so far and give you any recommendations regarding take home stretches and or exercises. They will create a plan of attack to ensure you get back to health as quickly as possible. Any suggestions regarding exercises and stretching will always be realistic and your massage therapist or myotherapist will aim to fit these into your currently lifestyle so you are more likely to do them. After your appointment your therapist will tell you get off the table slowly, redress and open the door. They will check how you are feeling and make sure they massage has given you results. They will then go back over any suggestions and/or advice they have given and create a plan of attack for the futmake recommendations on tell you when they think you should rebook (if necessary). They will then take you back to reception to finalise your payment where you can swipe your health card to claim on the spot. Just letting you know you may be a little sore after your treatment. This should subside within a few days. If it lasts longer than 4 days please give us a call. To help to reduce soreness and promote healing after a treatment make sure you have a warm shower and drink lots of water.